Kaitlyn Ludwig earned her Doctor of Occupational Therapy from the University of South Dakota. Kaitlyn completed a doctoral capstone in the use of OT with a sensory integration approach in the treatment of ideopathic toe walking. 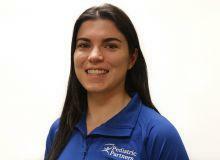 Kaitlyn has experience in acute care, inpatient rehab and outpatient pediatrics. She has gained additional eduation in sensory integration and toe walking, creating and implementation of sensory diets, and the difference between challenging behaviors and difficulties in sensory modulation in children. Kaitlyn's area of interest include Sensory Processing Disorder (SPD) and sensory-based feeding therapies.